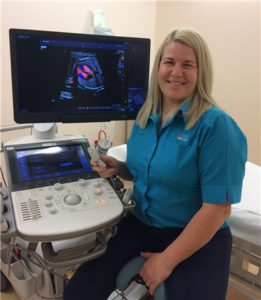 Medical Imaging department at the Broken Hill Hospital have taken delivery of two brand new ultrasound machines boasting the latest imaging technology. The Canon Aplio 600 ultrasound machines are used for all kinds of ultrasound examinations, including obstetric, gynaecological, vascular, musculoskeletal and general ultrasound. “It’s the latest technology giving us better resolution images and increasing our diagnostic capability,” said Ms Samantha Gogler, Medical Imaging Manager. Ms Gogler said the new ultrasound machines will also help in the future for training purposes. The new machines cost a total of $275,000 and replace two machines that were over 15 years old. Samantha Gogler, Medical Imaging Manager, with one of the two new ultrasound machines at Broken Hill Health Service.